Match officials with captains of Nasinu and Lami during the Vodafone Women’s Senior match at the FFA Academy Ground in Vatuwaqa last weekend. Lami won 3-0. Photo: Fiji FA Media. The 2017 Vodafone Women’s Senior League continued last weekend at Fiji FA Academy Ground in Vatuwaqa for the south­ern division. Three matches were played where Lami deafeted Nasinu 3-0, Rewa beat Navua 4-1 while Tailevu Naitasiri won 4-1 against Suva in the last match. 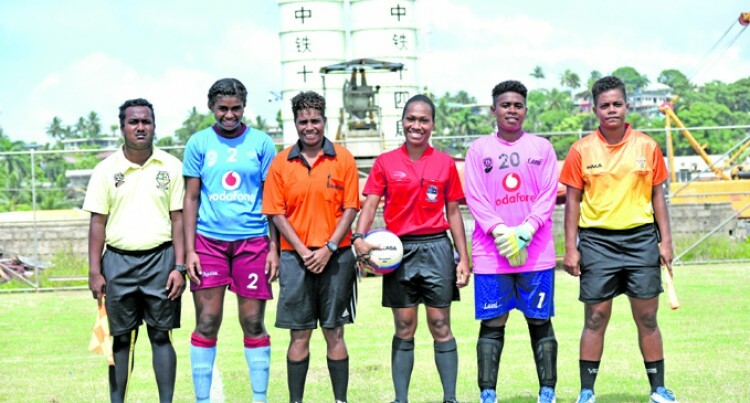 Fiji Football Association Women’s Development Officer Waifune Tupua says women’s competitions needs to be taken seriously by par­ticipating teams. “We have been doing our part but some teams are not taking the game seriously,”Tupua said. “Some teams are not taking the competitions seriously as we can see they came without training and were unfit in the match,” she said. ‘We are now playing 90 minutes of football and that is the way to devel­op women’s football but we can’t do much when the players are not com­mitted. She said she hope the teams would come more prepared in the competi­tion this weekend. “We want to finish off the competi­tion and start with new season and I hope the teams will come more pre­pared from this week. Tailevu Naitasiri currently led the Southern Zone Women’s League with 27 points after playing ten matches and Rewa is on second spot with 25 points after playing ten matches. Navua is on third position with sixteen points after playing nine matches. Suva is on fourth spot while is on fifth and Lami sit on the bottom of the points table and are yet to register a win. Meanwhile the match between Lautoka and Tavua in the Vodafone Women’s Senior League which was scheduled last Sunday was postponed due to unviability of the ground.